To make this Ormus Oil I took Extra Virgin Cold Pressed Olive Oil and added Dead Sea Salt and Sea90. Then I shook it up sporadically the next 3 days while I let it sit in a M.E.O.W. device. Finally I filtered out the salt and added C60 powder. Buckminsterfullerene (or bucky-ball) is a spherical fullerene molecule with the formula C60. It has a cage-like fused-ring structure (truncated icosahedron) which resembles a football (soccer ball), made of twenty hexagons and twelve pentagons, with a carbon atom at each vertex of each polygon and a bond along each polygon edge. It was first generated in 1985 by Harold Kroto, James R. Heath, Sean O'Brien, Robert Curl, and Richard Smalley at Rice University. Kroto, Curl and Smalley were awarded the 1996 Nobel Prize in Chemistry for their roles in the discovery of buckminsterfullerene and the related class of molecules, the fullerenes. The name is a reference to Buckminster Fuller, as C60 resembles his trademark geodesic domes. Buckminsterfullerene is the most common naturally occurring fullerene molecule, as it can be found in small quantities in soot.Solid and gaseous forms of the molecule have been detected in deep space. Rats lived 90% longer on C60 in olive oil. 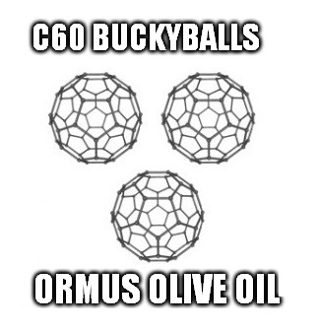 Professor Moussa, leader of the study team says in the interview that C60 (Buckminsterfullerene) is totally non-toxic. He has been researching Fullerene C60 for 18 years. Perhaps the most interesting part of the interview is that the research team killed the last surviving rat after 5.5 years because they were eager to conclude the experiment and publish its incredible results. So that rat did not die of natural causes and could have lived even longer. The Wistar rat used in the study normally lives only 2 to 3 years. Sea water contains 92 minerals, trace elements and organic compounds plus more than 50,000 organic substances. Over fifteen million gallons of sea water are used each year for the production of SEA-90 minerals and trace elements. Only a few ounces of mixed with water creates a "seamazing fertilizer", and as little as one ounce of SEA-90 Essential Minerals fed daily to livestock provides nearly complete mineral nutrition. Scientists report that the major benefit of SEA-90’s minerals and trace elements is to stimulate, feed and enhance micro flora populations. Micro flora or micro biota live in the soil, on plant tissue, and in the digestive systems of all life forms. Iodine: Important for the correct functioning of the thyroid gland and is aids in the body’s metabolic exchanges. Potassium: Great for people who suffer from asthma because it improves oxidation of the muscles of the nervous system. Zinc: Contains anti-oxidant properties which help to reduce the early signs of aging. It also helps to speed up the healing process. The clean, unpolluted air and warm climate at the Dead Sea provide a healing environment that is like no other place in the world. Salt is composed of natural healing elements that happen naturally in our bodies but are often lost as we go about our busy days. Today, modern science has proven the therapeutic and rejuvenating characteristics of Dead Sea salt with its unique composition of minerals. Medical research and numerous studies have all documented the healing effects of these minerals to treat skin conditions and other problems—arthritis, eczema, psoriasis—the list goes on. Today, the Dead Sea is surrounded by treatment facilities, resorts and spas. Thousands of visitors go throughout the year to partake in this healing environment. All of these minerals combined help improve skin hydration and reduce inflammation. In addition, Dead Sea salt is also considered great for detoxing.